Dense genetic maps of mammalian genomes facilitate a variety of biological studies including the mapping of polygenic traits, positional cloning of monogenic traits, mapping of quantitative or qualitative trait loci, marker association, allelic imbalance, speed congenic construction, and evolutionary or phylogenetic comparison. In particular, single nucleotide polymorphisms (SNPs) have proved useful because of their abundance and compatibility with multiple high-throughput technology platforms. SNP genotyping is especially suited for the genetic analysis of model organisms such as the mouse because biallelic markers remain fully informative when used to characterize crosses between inbred strains. 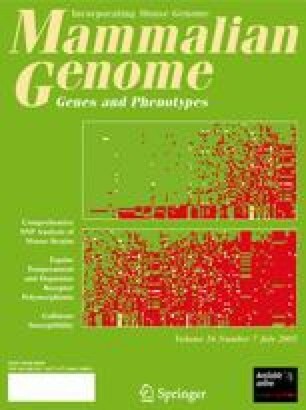 Here we report the mapping and genotyping of 673 SNPs (including 519 novel SNPs) in 55 of the most commonly used mouse strains. These data have allowed us to construct a phylogenetic tree that correlates and expands known genealogical relationships and clarifies the origin of strains previously having an uncertain ancestry. All 55 inbred strains are distinguishable genetically using this SNP panel. Our data reveal an uneven SNP distribution consistent with a mosaic pattern of inheritance and provide some insight into the changing dynamics of the physical architecture of the genome. Furthermore, these data represent a valuable resource for the selection of markers and the design of experiments that require the genetic distinction of any pair of mouse inbred strains such as the generation of congenic mice, positional cloning, and the mapping of quantitative or qualitative trait loci. The content of this publication does not necessarily reflect the view or policies of the Department of Health and Human Services, nor does mention of trade names, commercial products, or organizations imply endorsement by the U.S. Government. This project was funded in whole or in part with federal funds from the National Cancer Institute, National Institutes of Health, under Contract No. N01-C0-12400.